Amy Glen, winner of the women’s 15K classic race. Not only did the UVM ski team win the 2012 NCAA Skiing Championships, they outpaced the competition with two record-breaking numbers—an overall score of 832 points and a 162-point margin over second place Utah. "You dream about things falling together like they did," says coach Bill Reichelt. "We really had as perfect a week as you can possibly imagine." The national victory came on the heels of winning the Eastern Intercollegiate Ski Association Championship, a title the Catamounts captured for the second time in two years. Reichelt, director of skiing and head alpine coach, credits a depth of talent on the team for its successful season, including those who qualified for the NCAA championships but, because of the limit of twelve athletes per team, did not make the trip to Bozeman, Montana. "Everyone skied to their potential and strength," Reichelt says of the team's performance at nationals, adding that the Catamounts also performed exceedingly well in events that historically have not been as strong. This year's win is the sixth in the program's history, following past UVM national championships in 1994, 1992, 1990, 1989, and 1980. 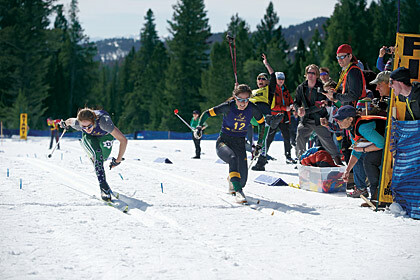 Leading the Cats to victory were two women who captured the titles in their individual events, one alpine, one Nordic. Sophomore Kate Ryley, from Toronto, won the women's slalom with a two-run total time of 1:35.17 (17-tenths of a second faster than teammate Kristina Riis-Johannessen.) And senior Amy Glen, from Anchorage, was winner of the women's 15K classic race. Ryley's win came under trying circumstances. "Kate shattered her hand earlier this year," Reichelt says. "She had three operations and was unable to train slalom for about two months." On top of that season setback, Ryley, who was named women's collegiate alpine skier of the year by Ski Racing Magazine in 2011, also heard some very difficult news the morning of the slalom at nationals: close friend and former teammate from Canada Nik Zoricic had died in a skiercross competition accident in Switzerland. Despite these challenging conditions, Ryley turned in two runs down the course that earned her a national title her sophomore year. "I couldn't believe it," Ryley says of her win. "I knew I had a lot of time to make up on the second run, and I knew the course was going to get rough. I had to go for it but ski smart at the same time." 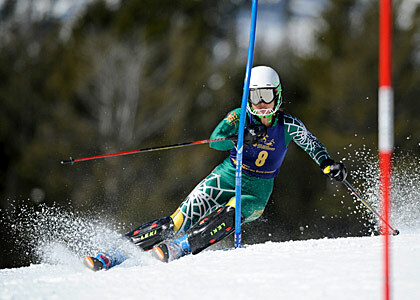 She is the first Catamount to win an individual title in the slalom since Gibson LaFountaine won back-to-back championships in 1993 and 1994. Ryley, a business major with a concentration of entrepreneurship and marketing, is the third UVM skier to win a slalom title at the NCAAs on the women's side. Glen's win ended with a thrilling photo finish when she crossed the line less than two inches ahead of rapidly closing Dartmouth skier Sophie Caldwell. The time between the photo finish and the delivery of the results was tense for anyone watching. But the athlete, modest about her successes both on the snow and in the classroom, says she was content no matter the results. "I knew that whether Sophie or I had gotten it, I’d given it my best effort, which was my real goal,” Glen says. “Whether I was second or first wasn’t going to change how I felt about my race." Glen closed out her final semester at UVM as a national champion in skiing with a 3.96 GPA as a biology major and animal science minor. "UVM was a place where I was excited about both the ski team and the academics they had to offer," she says of her decision to enroll four years ago. As for what will come next, "there's almost surely more school" on the agenda down the road. But in the meantime her plan is to "stay in the East and give skiing a shot full-time this next year."